China’s shipbuilders have doubled their market share in recent years. It is hard to determine the role of industrial policy, particularly subsidies, in this because we do not know what policies are in place. This column argues that subsidies decreased shipyard costs in China by between 13% and 20% between 2006 and 2012. These policy interventions have led to substantial misallocation of global production with no significant consumer surplus gains. Japan, in particular, has lost market share. In recent years, Chinese firms have rapidly come to dominate a number of capital intensive industries, such as steel, auto parts, solar panels and shipbuilding.The share of labor intensive products in Chinese exports fell from 37% to 14% between 2000 and 2010 . On a monthly basis, in 2011 the US imported advanced-technology products from China 560% more than it exported to China. By contrast, the monthly US-China trade surplus in scrap (used as raw material) grew by 1187% between 2000 and 2010 . (U.S.-China Economic and Security Review Commission 2011). We can see these rapid changes in trade statistics. The share of labour-intensive products in Chinese exports fell from 37% to 14% between 2000 and 2010. In 2011, on a monthly basis, the US imported advanced-technology products from China 560% more than it exported to China. By contrast, the monthly US-China trade surplus in scrap, which is used as raw material, grew by 1,187% between 2000 and 2010 (US-China Economic and Security Review Commission 2011). Yet, even though industrial subsidies have steered industrialisation and growth in several regions (a well-known example is East Asia), little is known about their quantitative impact on production reallocation across countries, or on industry prices, costs, and surplus. Government subsidies to industries are notoriously difficult to detect and measure. This problem is particularly acute in China (Haley and Haley 2008). International trade agreements also prohibit direct and in-kind subsidies, so it is not surprising that there is little or no explicit data. Thus, we often do not know if subsidies even exist, let alone their magnitude. In recent work, I assess the consequences of government subsidies on industrial evolution, focusing on the recent Chinese expansion (Kalouptsidi 2017). Since measuring these subsidies would be a prerequisite to evaluating their impact, I use an empirical strategy to detect their presence, and gauge their magnitude. I apply this to the world shipbuilding industry, a long-time target of industrial policy in other countries. In 2006, the Chinese government identified shipbuilding as a strategic industry, and introduced a plan for its development. In a short time, its market share doubled from 25% to 50%, at the expense of Japan, South Korea, and the countries of Europe. Some observers asserted that China's rapid rise was driven by hidden government subsidies that reduced shipyard production costs, not least because the industry benefited from new shipyards that were constructed as a consequence of this government plan. My research is designed to analyse the relative contribution of these interventions. In the words of the WTO (2006): "Systematic data (on industrial subsidies) are non-existent; reliable sources of information are scarce and mostly incomplete ... because governments do not systematically provide the information." Even if we can identify the subsidies, we still need to evaluate any injury caused by them. How would have the industry evolved without them? Alongside the steel, mining, and automotive industries, shipbuilding is one of the major recipients of subsidies globally. Governments tend to consider it a strategic industry, because it increases industrial and defence capacity, generates employment and has important spillovers to other industries (such as iron and steel). From the 1850s Britain was the world-leading shipbuilder, until it was overtaken by Japan in the 1950s. In turn, Japan lost its leading position to South Korea in the 1970s. Today, shipbuilding represents 4.5% of South Korea's GDP. China's 11th National Five-year Economic Plan (2006-2010) was the first to anoint shipbuilding as a strategic industry in need of ”special oversight and support”. As part of the national plan, the National Development and Reform Commission (NDRC) and the Commission of Science, Technology and Industry for National Defence (COSTIND) introduced a medium- and long-term plan for the shipbuilding industry,The plan was introduced by the National Development and Reform Commission (NDRC) and the Commission of Science, Technology and Industry for National Defense (COSTIND). which set the goal of China becoming the largest shipbuilding nation within a decade (OECD 2008). The plan sets specific output and capacity goals involving investment in shipbuilding infrastructure and financial support for output growth, including increased credit allowance and low input prices. Consistent with these government programs, Figure 1 shows a rapid expansion in the number of dry docks (a measure of shipbuilding capacity). It is important to note that the majority of this expansion (82%) was realised through the construction of new facilities, so that the industry experienced a massive entry wave in 2005 and 2006. In contrast to this capital expansion, subsidies to reduce operating costs cannot be observed directly. Yet, consistent with such measures, China's production and market share increased dramatically as the programmes were announced (Figure 2). 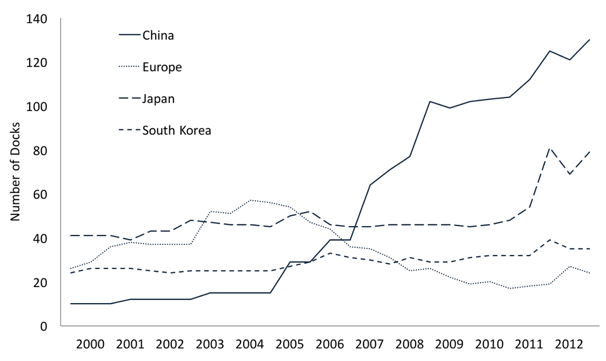 After 2006, China's market share more than doubled across all major ship types (Table 1). In addition, China's shipbuilding is mostly geared towards export sales which comprised about 80% of its production in 2006. In my paper, I estimate a dynamic model of the shipbuilding industry. The model captures the key features of this industry. In it, a large number of shipyards compete by producing ships. Their production decisions are subject to the time taken to build as ship, which is between two and five years. Shipyards accumulate backlogs, which can affect their future production cost, either positively (expertise acquisition) or negatively (capacity constraints). Production cost is also subject to steel price fluctuations, as steel is a key production input. World shipowners decide to buy new ships from world shipyards. Demand for new ships is driven by demand for international sea transport, which is uncertain and volatile. As ships are long-lived investments for shipowners, demand depends on expectations about future demand and fleet development. The main object of interest is the cost function of firms that potentially have been subsidised. As in many industries, however, we cannot observe the costs of production. Therefore I estimate costs from changes in demand, testing for a break when China launched its shipbuilding plan in 2006.1 In the simplest example of a static, perfectly competitive framework, marginal cost is recovered directly from prices. In that case, the detection strategy amounts to testing for a break in observed ship prices in 2006.To do this, I estimate the willingness to pay for a ship, using observed new and used ship prices. I then use the observed changes in this estimated willingness to pay alongside the shipyards' optimal production choices, to obtain their underlying cost function. I employ a rich dataset consisting of global contracts for purchases of new and used ships and firm-level quarterly ship production between 2001 and 2012. I use my framework to detect and measure changes in costs that would have been consistent with subsidies. I find a strong, significant decline in Chinese costs equal to between 13% and 20% of costs, or $1.5 to $4.5 billion at observed production levels. Alternative explanations for the recovered cost decline could not have adequately accounted for these observations. For example, the results are robust to many specifications that control flexibly for time-variation. Moreover, costs did not change in other countries. 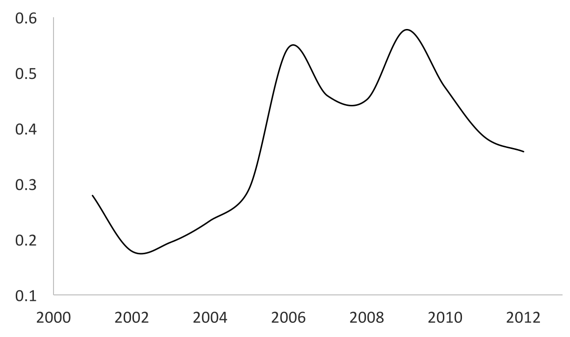 Bulk ship production is not characterised by technological innovation, and the results held when I estimate costs on the subset of shipyards that existed prior to 2001. This implies that cost declines were not driven by different technology in new shipyards, or optimisation as a result of learning-by-doing. Chinese interventions led to substantial reallocation in production. In the absence of China's government plan, Chinese market share would be cut to less than half, while Japan's share would increase by 70%. If only new shipyards were removed, China's share would fall from 50% to 40%. This suggests that new shipyards played an important, but not the predominant, part in China's expansion. Ship prices experienced moderate increases in all countries in the absence of China's plan, as the latter shifted supply outward. In the presence of subsidies, freight rates decreased moderately. This is because of the larger fleet between 2006 and 2012, and more so over time due to time-to-build. As a result of China's plan, cargo shippers gained about $400 million in shipper surplus over that time. This does not support the assertion that China developed shipbuilding to benefit from low freight rates for its trade. The benefits of subsidies to shipping were minimal. Perhaps, instead, the Chinese government sees positive externalities in sectors such as steel and defence or, even, national pride (Grossman 1990). Subsidies created a wedge in the alignment of market share and production costs. They led to a large increase in the industry average cost of production (net of subsidies) by shifting production away from low-cost Japanese shipyards towards high-cost Chinese shipyards. The Economist (2011), 'Perverse Advantage', 27 April. Grossman, M Gene (1990), 'Promoting New Industrial Activities: A Survey of Recent Arguments and Evidence'. OECD Economic Studies 14: 87-126. Haley, C, V Usha and George T Haley (2013), Subsidies to Chinese Industry: State Capitalism, Business Strategy and Trade Policy, Oxford University Press. Kalouptsidi, Myrto (2017), 'Detection and Impact of Industrial Subsidies, the Case of Chinese Shipbuilding'. CEPR Discussion Paper No. 12080. OECD (2008), Report of the Working Party on Shipbuilding: The Shipbuilding Industry in China, Paris: OECD. US International Trade Commission (2008), Antidumping and Countervailing Duty Handbook, 13th Edition. US-China Economic and Security Review Commission (2011), 'Report to Congress'. Washington DC: Government Printing Office. 1 In the simplest example of a static, perfectly competitive framework, marginal cost is recovered directly from prices. In that case, the detection strategy amounts to testing for a break in observed ship prices in 2006.